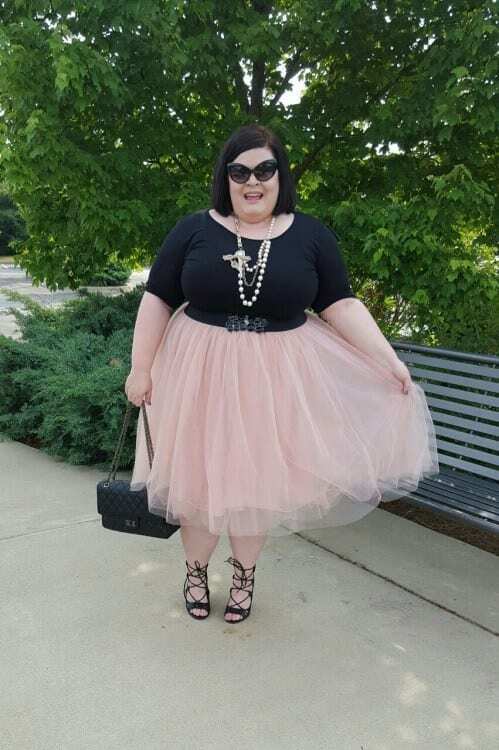 Plus size Party Wear- If you are a plus size women and are looking for ideas on what to wear on a party may it be a birthday bash,night party or get together of your BFF, then you’ll surely be finding loads of ideas here. We’ll be showing you a number of different gorgeous party wear and show how beautifully the plus size women have carried these outfits. And sure enough, if they can do it, why not you? Before we start with these outfits, let me tell you that as a plus size women you have every right to be obsessed with fashion, make-up, jewellery and what not. So be confident and go for any colour, design or style that you feel comfortable with, as long as you are comfortable in it. In fact, for a change, even try stepping out of your comfort zone and get inspiring every now and then. So here’s our selection of the best party outfits, specially for the spring and summer seasons. The best part about these outfits are that they wont cost you a fortune, and they can be worn at a number of different types of parties. A skirt can make a wonderful party outfit for almost any special occasion, but only if you make the right selection. Go for a design that places the emphasis on the top part of your body, rather than the middle. You can do this by choosing ones with a brighter coloured top. Or use the accessories in your wardrobe such as belts or chains to do this. This dress is an example of breaking the rules and going for any colour you love rather than sticking to the stereotype that plus size women can not wear multi coloured dresses. Again, the use of belts and accessories helps make your curves look picture perfect.An ideal outfit for Black Curvy Women. If you are not afraid of exposing then a pin up dress like this, if tailored nicely can give the perfect party look. Combine it with some matching heels and jewellery, and for your hair either go for a bun or a similar up do. The best thing about a wrap dress or blouse is that it makes your curves look flattering while giving a sensual hourglass body figure. If you want, you can make it look even more unique and spectacular by wearing a matching blazer and tying your hair in a ponytail.A perfect Plus size Dress with Blazer. Right Hairstyle that goes with the dress is the right key for looking fabulous .Make sure your hairstyles don’t go odd with your party dress. Spring/Summers a perfect time to put on your maxis. They can help enhance your figure but try to select ones that are tighter at the bust and loose around the thighs.Also see some of the stylish plus size maxi outfit ideas. Go for knee length skirts as they give a more slimmer and toned down effect. Cocktail Dress For Fat Girl. A classy cocktail dress can make a great party outfit. 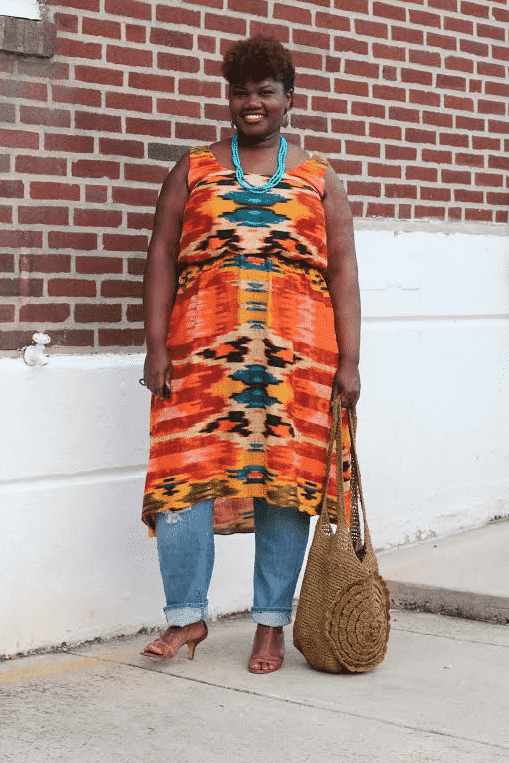 Dresses with smaller prints are best for plus size women. A printed hi-lo dress can be even more helpful.A beautiful Party Dress for Women with Big bust. Also see 20 cute outfit ideas for big bust ladies. Tunics Tops for Curvy Ladies. Tunics give an elongated look to your body and so make you look slimmer. A colourful tunic like this seems ideal for a pool or beach party. One of the most trending outfits these days is the gauchos pants and if used rightly, pluz size women can look breathtaking in them as well. Mixing prints is a great thing for curvy girls, the only rule is to have at least one colour in common between all the prints being used. Go Funky with Ripped Denim Shorts. Denims can create eye catching and yet casual looks no matter how you use them, as shorts or jackets.Also see 14 funky outfits combinations for curvy Ladies. Denim jacket with Polka dot Top and Converse. The layers in any flowy kaftaan can be very helpful for plus size women as you can design them so they hide any of your flaws while enhancing the best body parts of yours. Many brands have now started making overalls for plus size women. They are a great outfit to experiment with and so many ways in which to wear them. Try combining them with a jacket or belt or just go simple and rock any party. Shiny, classy and so attractive! LOVING THE OUTFITS SINCE AM ALSO N PLUS SIZE WOMEN I WOULD LOVE TO GET MORE OF YOUR IDEAS ON WHAT TO WEAR AND WHAT NOT.